By employing Design thinking in the classroom, we help students to tackle their problems with innovative solutions – building critical 21st century skills and making schooling meaningful. Through our 4 step process of Inspire-Design-Optimize-Create, we have exposed more than 1350 students to innovation, helping them identify 3000+ problems and prototype 350+ solutions of their own. Education should be liberating, not burdening. Consider Archana and Rajesh, two first generation learners studying in the 6th grade in a low-income school. Archana scored more than 95% in her last exam. While Archana’s report cards indicate that she will be successful, Rajesh who scored 20% is told in several direct & indirect ways that he is mediocre, struggling and has lesser chances of success. But the truth is that neither Archana nor Rajesh will succeed. They are not very different. ❖ Both are put into a giant system of imitation where regurgitation of definitions is all that is expected. ❖ Both believe that their marks are a true measure of their potential. ❖ Both never engage with real problems or the real world. ❖ Both will pass through their school years, without acquiring any skills, never given the opportunity to think or create anything of their own equally unprepared for the future. World Economic Forum estimates that 65% of children entering primary school today will ultimately end up working in completely new job types that don’t yet exist. In this ever changing, volatile, uncertain, complex and ambiguous world, being innovative and creative is the only way to flourish. Data suggests, around 1 million people enter the workforce in India every month. Out of the 300 million that entered the workforce since 1991, we could employ only 140 million. We must have the ability to generate livelihoods through innovation and entrepreneurship. An IBM Global study of 1500 CEOs has identified creativity as the #1 leadership competency of the future. But such critical 21st century capacity building is not focused upon in our schools. Our solution: Next Generation skills to First Generation Learners. According to the NBER– Importance of Innovation Report, Study of a million inventors revealed that exposure to innovation during childhood has significant causal effects on children's propensities to become innovative. And hence exposure is paramount in our innovation cycles. By employing design thinking in the classroom, we have helped students like Archana and Rajesh to be on the same platform and to tackle their problems head-on with innovative solutions – building critical 21st century skills and making schooling meaningful. Through our 4 step process of Inspire-Design-Optimize-Create, we have exposed kids to innovation and problem solving and helped them create solutions of their own. 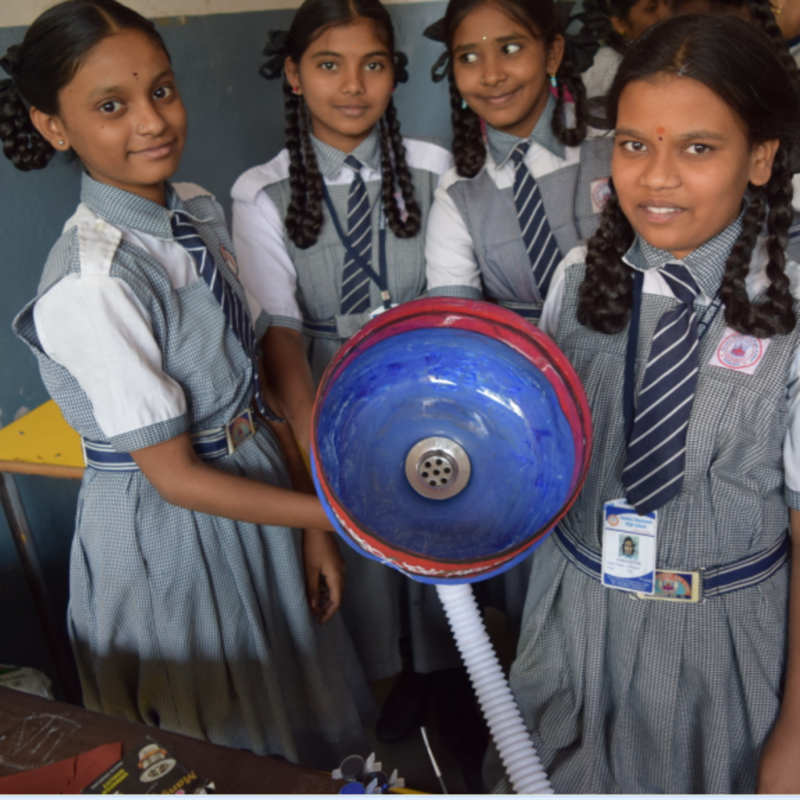 And the results are evident: Archana designed a solar conveyor belt to help her mother who had to walk more than 2 kms to get drinking water in her village, while Rajesh designed detachable magnetic wheels to move around benches and other heavy objects in his school. This is not just a one-off result. We have been working in Telangana with around 30 government and low-income private schools, generating more than 3000+ Ideas from 1350 middle schoolers, helping them build more than 350+ prototypes, and currently in the process of protecting some really good ideas through patents and publications. While the Innovation cycles, focused on nurturing creativity and innovation in schools, can be seamlessly integrated into the daily routine of the classrooms, Innovation toolkit aims to capture a set of Structures, Processes and Inputs from the ground up that would build capacity and nurture a Culture of Innovation within the schools. Innovation Toolkit will take a school from zero culture of innovation to a strong culture of innovation by working on 3 fundamental aspects that nurture the creative spirit in schools. c) Infrastructure: By helping schools evolve from a basic set of tools to an Atal Tinkering Lab via need based, data driven decisions. We wish to implement this by forming and strengthening student Innovation clubs which can support this culture building in schools. We believe that these interventions at classroom & school level will provide strong platforms to inspire, nurture & support student innovation, build essential future ready skills & help them develop strong connections with the people and world around. Interested Students, Invested teachers, Lots of problems to work on and few basic tools for tinkering. Mentorship is a critical aspect for building a culture of Innovation - students must have access to an ecosystem of mentors. Tools and Materials should not cost more than 1000$ per classroom per year.